"Neptune the sea god is my guardian. 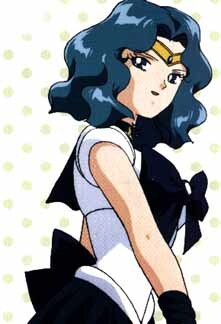 I am Sailor Neptune!" Michiru is one of those people who can be a perfectionist without trying. Whatever she does, she does well. She is very refined, graceful, and sophisticated. To quote a poster: "Her appearance and manners are those of a madmoiselle." Michiru is in love with Haruka. She possesses the 2nd talisman, the Deep Aqua Mirror. She goes to Mugen Gakuen High school with Haruka. But they're only posing as students because they think the school is the Death Busters hideout. They don't actually need to go to school. Her castle is the Triton castle. In Sailor Stars she and Haruka faked becoming evil so that they could use the bracelets Galaxia gave them to steal her star seed. Unfortunately, since Galaxia had no star seed, the plan failed.